How to Choose the Right Toilet! In earlier times, it was common for bathroom and toilets to be constructed separately from the houses, at least a bit far away from the place of residing. This is an ideal scenario according to Vastu Shastra. But as modern architecture has come to see due to soaring populations and decreasing availability of living spaces, toilets and bathrooms today have been integrated into the houses and offices themselves. Since it is certain that the modern houses develop a Vastu defect due to this, it does not necessarily mean that these defects will stay with you forever. There are apt remedies available that will help you remove any such toilet and bathroom defects from your house and convert the negative energy arising in the process into positive energy. When it comes to choosing the right toilets and their locations, renowned Vastu Expert Dr. Puneet Chawla explains that a toilet or bathroom is never to be located in the South-East part of your home or building. Instead, it should always be located at a higher level. The preferred location for bathrooms and toilets is the North-West with the location of commodes being in the South, West or North-West side of the toilet with the person sitting on it either facing the North of the South. On the other hand, the bathtub should be located such that the person bathing in it faces the South direction. Also, it is highly recommended that mirrors are placed only on the North and East walls. While the placement of things inside the toilet or bathroom matter a lot, even the placement of doors and windows. The East and West directions are considered to be the best for the placement of windows. On the other hand, the East and North directions are considered to be the best for the placement of doors. 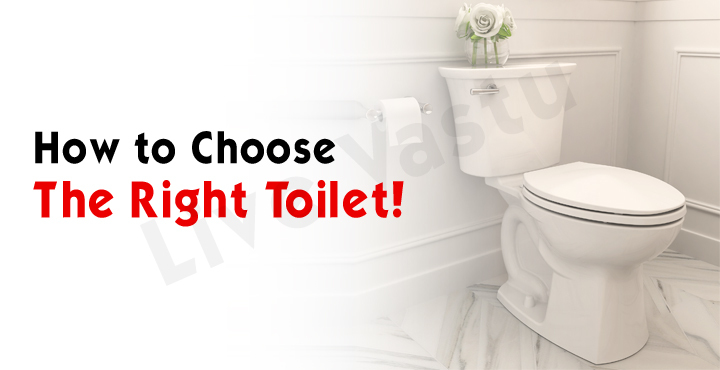 Even the aesthetic appeal of the toilet like colors play an important part in its Vastu. Hence, lighter colors like white and cream are considered to the best for painting them. This is why most toilets usually have lighter shades of paint than the rest of the house. According to Dr. Puneet Chawla, the South-West is an auspicious direction and it should not contain any sort of drainage systems or openings. Hence, it can be easily understood why having a toilet here can be detrimental to the energy of the house as a toilet is full of such drainage systems and pipes. This should be taken care of since toilets have a tendency to become a major source of negative energies if they are not built and maintained according to the required guidelines. We assume that you have understood the importance of Vastu oriented toilets and bathrooms and that you would follow the above-given advice and tips to make your toilet Vastu compliant.